Do you need Your Logo in a Vectored Format or made higher resolution? Signs for Success can take your logo from a business card or website, vectorize it, and provide it to you in a number of higher resolution formats overnight! If you need .eps, .pdf, or .ai vectored files for any reason, give us a call now for fast service. Why vectored artwork? See the difference between Vectored and Rastered images. 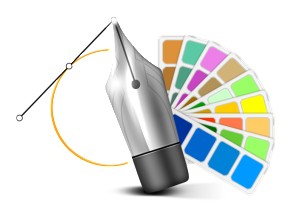 Professional logos are usually designed in vector-based programs, like Adobe Illustrator; however, many people who design their own logo use Publisher, Word or other simple programs that save a low quality rastered logo. Vector graphics are made up of points and paths that represent the image on the computer. Pixel based graphics (often called raster or bitmap) are made of individual bits, or pixels that represent the image on the computer. So what’s the benefit of having a vector-based logo? Vector based images can be scaled by any amount without losing quality of the image. This is essential with logo design since it will be used in a vast number of formats and variety of sizes. You want your logo to look as crisp and clear on your vehicle or banner as it does on your business card and other printed material. Pixel based images do not enlarge well. The quality is lost and you will usually get a blurry image. In addition, everything on the web is low resolution (72dpi), so if you copy your logo off your web site it will not be good enough for print. Why use Signs for Success to vectorize your logo? Signs for Success not only turns it around fast for you, but we talk to you directly so that even minor shape or color changes can happen now instead of taking days or weeks. You get to speak to a real person, and we care enough to help you get what you want. Most logos can be vectorized for a flat fee of $48, and once we see what you want to vectorize, we can tell you if it fits in the flat fee or requires more design time to recreate. Approximately 95% of the logos we vectorize fall into the “flat fee” category. Just give us a call and we’ll help you take the next step! Get started by uploading your artwork now.